His style of deal-making prizes uncertainty and brinkmanship, without a plan for what comes next. One of America’s senior statesmen predicted earlier this year that Donald Trump’s hunger for success would push the president toward a more traditional foreign policy. I countered that it depends on how Mr. Trump defines success. We now have an answer: Mr. Trump’s foreign policy reflects his instinct for political realignment at home, based on celebrity populism. Populist movements feed off grievances and impatience with traditional politics. Frustrations—whether generated by economic distress, social displacement, or cultural challenges—fuel skepticism about institutions and elites. Challengers (who want to become the new elite) attack traditional leaders as out of touch, incompetent and corrupt. Mr. Trump rallies his supporters by proclaiming the three presumptions of populism. First, it professes to reflect the will of a scorned people. Hillary Clinton called them “deplorables.” The will of the people is intolerant of the give-and-take of pluralism and disdains the identity politics of the Democratic Party. Second, populism finds and blames enemies, domestic or foreign, who thwart the people’s will. Mr. Trump has mastered insulting such scapegoats. Third, populism needs “the leader,” who can identify with and embody the will of the people. Like other populist leaders, Mr. Trump attacks the allegedly illegitimate institutions that come between him and the people. His solutions, like those of other populists, are simple. He contends that the establishment uses complexity to obfuscate and cover up misdeeds and mistakes. He claims he will use his deal-making know-how to get results without asking the public to bear costs. Mr. Trump’s foreign policies serve his political purposes, not the nation’s interests. He says the U.S. needs to build a wall to keep Mexicans at bay—and Mexico will pay for it. He asserted he would block Muslims from coming to America to harm us. His protectionist trade policies are supposed to stop foreigners from creating deficits, stealing jobs, and enriching the corporate elite. Mr. Trump also asserts that U.S. allies have been sponging off America. The U.S. military is supposed to hammer enemies and not bother with the cleanup—even if the result, for example in Syria, is an empowered axis of Iran, Shiite militias, Hezbollah and Bashar Assad’s regime. The president’s emphasis on discontinuity—breaking things—demonstrates action while disparaging his predecessors. He pulled out of the Trans-Pacific Partnership, but the other 11 countries are proceeding without the U.S. 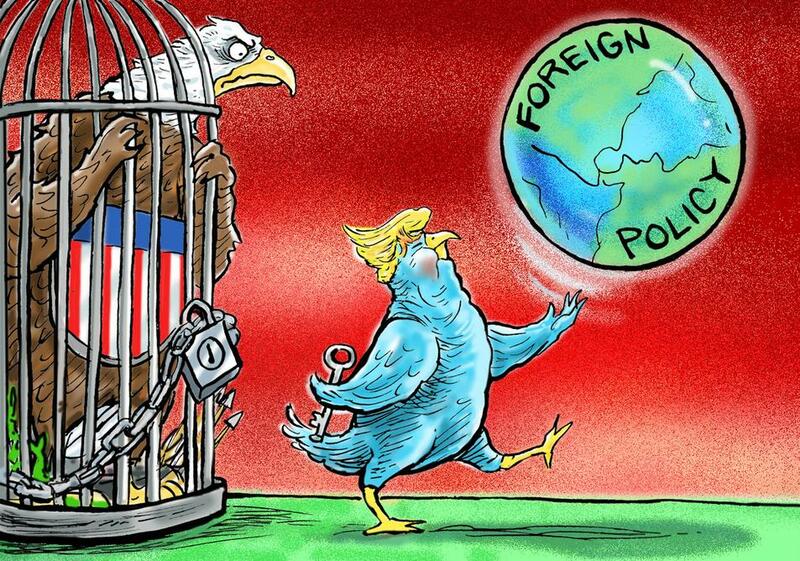 He wants to destroy the North American Free Trade Agreement and strangle the U.S.-Korea Free Trade Agreement; he also is threatening the World Trade Organization’s rules and system for settling disputes. His style of deal-making prizes uncertainty and brinkmanship, which risks escalation, without a plan for what comes next. Mr. Trump’s foreign policy represents a break from postwar presidents of both parties, reaching back to Harry S. Truman. Other presidents led an alliance system that recognizes U.S. security is connected to mutual interests in Europe, the Asia-Pacific region and the Middle East. Past presidents believed that the U.S. economy would prosper in a world of expanding capitalism, governed by adaptive rules and practices that matched America’s competitive and dynamic markets. Over time, U.S. foreign policy strove to expand human rights, liberty and democracy. Mr. Trump dismisses this U.S.-led international system as outdated, too costly and too restrictive of his case-by-case deal-making. The 70-year-old U.S. foreign policy architecture has been grounded in institutions. But Mr. Trump disdains America’s intelligence agencies and is dismantling the State Department. His foils at home are the courts, the press, a clumsy Congress beholden to antiquated procedures, and even his own Justice Department. Mr. Trump’s recent trip to Asia reveals that foreigners have taken his measure. They play to his narcissism. He in turn basks in their attention, diminishes his own country by blaming past presidents, and preens with promises of great but unspecified things to come. Other countries are preparing for a world in which they can expect U.S. demands but can no longer rely on American leadership. The president’s need to project an image of personal power—for his domestic audience and his ego—makes him more comfortable with authoritarian leaders. Presidents Xi Jinping, Vladimir Putin and Rodrigo Duterte have noticed, as has part of the Saudi royal family. Democratic leaders, accountable to public opinion, face a more complex choice: They can keep their distance and risk Mr. Trump’s ire or try to manipulate him through frequent attention, royal treatment, golf and courtship of the family. Yet Mr. Trump’s ride on the populist wave—and the foreign policy that matches his politics—faces a big obstacle: Most Americans do not agree with his approach. Significant majorities prefer the fundamentals of the foreign policies Mr. Trump is deconstructing, according to a 2017 survey of American adults from the Chicago Council on Global Affairs. Sixty percent say alliances with Europe and East Asia either are mutually beneficial or mostly benefit the U.S. Record numbers say international trade is good for consumers (78%), the economy (72%) and job creation (57%). Some 65% support providing illegal immigrants a path to citizenship, and only 37% characterize immigration as a critical threat. All these numbers have shifted against Mr. Trump’s positions since the election. Elected Republicans face a moment of decision. Voters with a very favorable view of Mr. Trump are moving toward protectionism and against alliances and immigration. Mr. Trump’s Republican Party pits nationalism against America’s internationalism, whereas for 70 years GOP leaders saw them as two sides of a coin. Democratic leaders face a challenge as well. Their voters, especially younger ones, increasingly support trade, according to Chicago Council data. Democrats will need to decide whether to compete with Mr. Trump’s isolationist economic nationalism or offer a new vision of American leadership. Mr. Trump’s foreign policy represents a change of type, not simply degree. Previous populist impulses in the U.S. ran their course, creating opportunities for adaptation, not simply disruption. Patriotic Republican and Democratic leaders must challenge Mr. Trump’s foreign-policy destruction. Political defeat is not the same as ideological defeat. The debate over ideas is just beginning. Mr. Zoellick is a former World Bank president, U.S. trade representative and deputy secretary of state. 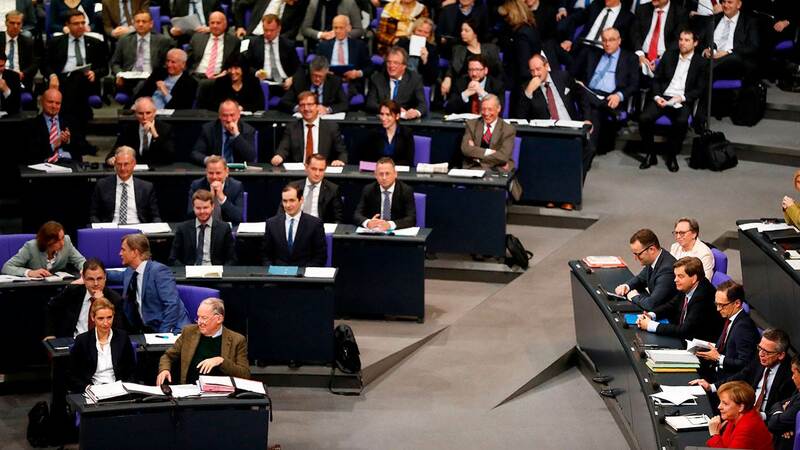 NEW YORK – Friends of Germany and Europe around the world have been breathing a sigh of relief at the newfound willingness of Germany’s Christian Democrats and Social Democrats (SPD) to discuss reprising their grand coalition government. The world needs a strong and forward-looking Germany in a dynamic European Union. A new grand coalition working alongside French President Emmanuel Macron’s government would make that possible. The SPD’s initial decision to go into opposition after its poor election result in September may have been sincere, and even strategically sound. But it is not timely. Diplomacy almost everywhere is fractured. The United States is reckoning with a psychologically unstable president, a plutocratic cabinet, and a Republican congressional majority. Europe is in the throes of multiple economic, social, political, and institutional crises. China, by contrast, is dynamic and outward-looking – providing good reason for the EU to assume vigorous leadership and engage in constructive partnerships with China on key initiatives (such as sustainable infrastructure across Eurasia). In short, this is a critical time for Germany and Europe to provide vision, stability, and global leadership. And that imperative extends to Chancellor Angela Merkel’s Christian Democratic Union (CDU), its Bavarian sister party, the Christian Social Union (CSU), and the SPD. But the CDU/CSU and the SPD need to do more than merely extend the previous government, which was too parochial in outlook and temperament. The world and Europe need an outward-looking Germany that offers more institutional and financial innovation, so that Europe can be a true counterpart to the US and China on global affairs. I say this as someone who believes firmly in Europe’s commitment and pioneering statecraft when it comes to sustainable development, the core requirement of our time. Economic growth that is socially inclusive and environmentally sustainable is a very European idea, one that has now been embraced globally in the United Nations’ 2030 Agenda and its 17 Sustainable Development Goals, as well as in the 2015 Paris climate agreement. Europe’s experience with social democracy and Christian democracy made this global vision possible. But now that its agenda has been adopted worldwide, Europe’s leadership in fulfilling it has become essential. A grand coalition government in Germany must help put Europe in a position to lead. French President Emmanuel Macron has offered some important ideas: a European finance minister; Eurobonds to finance a new European investment program; more emphasis on innovation; a financial transactions tax to fund increased aid to Africa, where Europe has a strategic interest in long-term development; and tax harmonization more generally, before the US triggers a global race to the bottom on taxing corporations and the rich. Contrary to the Germans who oppose such ideas, a European finance minister and Eurobonds would not and should not lead to fiscal profligacy, but rather to a revival of investment-led green growth in Europe. China has proposed the Belt and Road Initiative to build green infrastructure linking Southeast Asia and Central Asia with Europe. This is the time for Europe to offer the same bold vision, creating a partnership with China to renovate Eurasia’s infrastructure for a low-carbon future. If Europe plays its cards right, Europe’s (and China’s) scientific and technical excellence would flourish under such a vision. If not, we will all be driving Chinese electric vehicles charged by Chinese photovoltaic cells in the future, while Germany’s automotive industry will become a historical footnote. A European finance minister would, moreover, finally end Europe’s self-inflicted agony in the aftermath of the 2008 financial crisis. As difficult as it is to believe, Greece’s crisis continues to this day, at Great Depression scale, ten years after the onset of the crisis. This is because Europe has been unable, and Germany unwilling, to clean up the financial mess (including Greece’s unpayable debts) in a fair and forward-looking manner (akin to the 1953 London Agreement on German External Debts, as Germany’s friends have repeatedly reminded it). If Germany won’t help to lead on this issue, Europe as a whole will face a prolonged crisis with severe social, economic, and political repercussions. In three weeks, Macron will convene world leaders in Paris on the second anniversary of the climate accord. France should certainly take a bow here, but so should Germany. During Germany’s G20 Presidency, Merkel kept 19 of the 20members of the G20 firmly committed to the Paris agreement, despite US President Donald Trump’s disgraceful attempt to wreck it. Yes, the corruption of US politics (especially campaign funding by the oil and gas industry) threatened the global consensus on climate change. But Germany stood firm. The new coalition should also ensure that the country’s Energiewende (“energy transition”) delivers on the 2020 targets set by previous governments. These achievable and important commitments should not be a bargaining chip in coalition talks. A CDU/CSU-SPD alliance, working with France and the rest of Europe, could and should do much more on climate change. Most important, Europe needs a comprehensive energy plan to decarbonize fully by 2050. This will require a zero-carbon smart power grid that extends across the continent and taps into the wind and solar power not only of southern Europe but also of North Africa and the eastern Mediterranean. Once again, Eurobonds, a green partnership with China, and unity within Europe could make all the difference. Such an alliance would also enable a new foreign policy for Europe, one that promotes peace and sustainable development, underpinned by new security arrangements that do not depend so heavily on the US. Europe, a magnet for hundreds of millions of would-be economic migrants, could, should, and I believe would regain control of its borders, allowing it to strengthen and enforce necessary limits on migration. The political terms of a new grand coalition government, it would seem, are clear. The SPD should hold out for ministerial leadership on economic and financial policy, while the CDU/CSU holds the chancellorship. That would be a true coalition, not one that could bury the SPD politically or deny it the means to push for a truly green, inclusive, EU-wide, sustainable development agenda. With Merkel and SPD leader Martin Schulz in the lead, the German government would be in excellent, responsible, and experienced hands. Germany’s friends and admirers, and all supporters of global sustainable development, are hoping for this breakthrough. As I read articles in early 2016, the debate centered around how deep the “crash” is going to take us, and much of it was event-focused. As I now read articles as 2017 comes to an end, they are still discussing how deep the “crash” is going to take us, and it still remains event-focused. But, while many are debating that issue, I now see much debate on how high this market will take us. When investors begin to turn towards the “how high” debate is the point in time where one must become truly worried about how high this market can take us. You see, market sentiment is a funny market driver. When the great majority of market participants speak in terms of inevitable crash, you should be looking for an imminent bottom. However, when the great majority are speaking in terms of “new paradigm,” or how the market will “certainly continue in its current trend,” then its time to begin to look towards a market top. A change in market direction will rarely be seen by most market participants. You see, they buy into the common speak of analysts and market participants. And, just when the majority is quite certain of the markets next larger move, the market usually “surprises” them with the opposite directional move. Now, if anyone is looking for certainty in the stock market, then I suggest you take a heavy dose of reality and call me in the morning. You see, just like life, there is simply no certainty in the stock market. Rather, for those who really understand how the market works, we must view the market from a probabilistic perspective. And, that is the reason you see my analysis provided within an if/then framework. Yet, take note that my analysis is NEVER event-based. We use our Elliott Wave analysis to assist us in identifying what we believe to be the most probable next move and target in the market. We have also developed our Fibonacci Pinball system to provide us with a more objective perspective overlaid upon the standard Elliott Wave structure. And, we use this system to identify high probability regions at which the market can turn. As an example, back in early 2016, when the market was dropping down to the 1750-1800 region (for which we saw the potential before the heart of the drop began), we identified this bottoming target as a potential turning point for the market to then turn back up and rally to our next larger degree target in the 2537-2611 region. As another example, back in July of 2017, we presented our analysis which suggested that around the August 9th timeframe, the market can provide us with a turning point between the 2487-2500 region, with a downside ideal target between 2330-2380SPX. As we know, the market topped on the afternoon of August 8th at 2490SPX (exactly where we expected a turning point), and provided us with the largest pullback we had experienced since November of 2016. But, we came up a bit short of our ideal target region (we bottomed at 2417SPX) before we began the rally towards the upper end of our target region set two years ago. So, again, we often identify high probability turning points, but there is no way we will be able to identify ALL the turning points, as we are dealing within a non-linear environment. However, we apply an objective analysis methodology to provide us with the highest degree of probability perspectives possible. Moreover, our objective analysis methodology told us clearly that, once we broke back over the 2460SPX region, the upside to the market opened up in a big way. So, even though we did not achieve the ideal downside target we set, our methodology told us quite clearly that we should not retain a strong bearish bias once the market moved back up through the 2460SPX region. This is one of the main differences between our methodology, and many of the others that have retained a bearish bias, even for as long as the last two years or more. When one can accurately decipher the clues provided by the market within the patterns presented by price movements, one can identify objective criteria for which your bearish or bullish bias should be maintained or discarded, rather than remaining on the wrong side of the market for an extended period of time. Yet, as I continue to read article after article, the incessant debate continues regarding what “event” will cause the next market down turn. How many articles have you read in the last year and a half which have been event-focused? I would believe the great majority of them. Brexit, Frexit, North Korea, Spain, Italy, terrorism, Trump, and many, many more. And, while we have seen the prognosticated events occurring, we have certainly not seen the expected turn in the financial markets. Meanwhile, I see bearishly focused authors note quite clearly that their old models no longer work, yet they continue to provide the same analysis using the same old models to come to the same old conclusions. Yes, we live in head-scratching times indeed. Yet, the debate continues on, but with renewed focus upon the next prognosticated event. Have you ever asked yourself why you bother? If you see the expected event occurring, yet the market simply does not care, does that not tell the reasonable person that maybe you are focusing on something that really does not matter? The market is telling you that is the case. So, why are you not listening? And, since event-based analysis has kept most, for the most part of the last two years, looking the wrong way in the stock market, maybe it is time to realize that it is really not the event itself which causes the market turn, but, rather, the public’s interpretation of that event as related to the stock market. The reaction is seen in the price moves, as people vote their reactions based upon their buying and selling. So, should not your analysis be based upon what price is telling you? Should not your analysis be price-focused above all else? To say “no” to these questions suggests that you have not been paying attention the last two years. If the market does not really care about events, why should you? And, to continue to apply event-based analysis on this market is simply what Einstein defined as “insanity.” So, yes, the great majority of investors today seem to be insane, especially when you read the endless debate about what the market will do at the next event. Currently, the market seems to be suggesting that we are involved in a “topping process.” While many of the uber-bears will be licking their chops when I say that, the “top” we seem to be developing will likely only provide us with a standard pullback towards the 2330-2400SPX region before we begin the next rally phase in this bull market with a target in the 2800 region. So, while the market may top alongside some perceived “catalyst,” do not assume that the catalyst was the absolute “cause” of that pullback. Learn from your experiences of the last two years.